Grey Owl Indian Crafts - Native American Indian craft supplies BEADED RAWHIDE RATTLE- 6-3/4"
The head is made from rawhide and the contents inside the "puffed up" head makes a rattle noise when shook. The head is 1 3/4" W.
The rattle is wrapped with sinew. 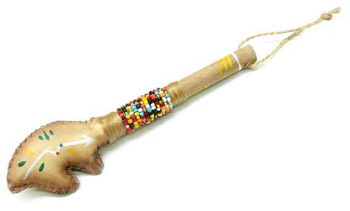 The talking stick has a stained wooden stem wrapped with seed beads.